In the adult population, when a patient sustains a cardiovascular insult requiring surgery or some other form of medical therapy and quite often the patient is referred to cardiac rehabilitation. With increased survival rates following cardiac surgery(1) cardiac rehab is an important component to the overall recovery of the patient by safely returning them to their prior level of function it has also been shown to reduce morbidity, readmission rates and cost (1). An important component to the evaluation process for cardiac rehabilitation is the results from exercise testing. 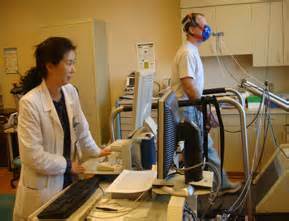 Testing is either performed by a cardiologist before referral or in the outpatient clinic by a physical therapist or exercise physiologist. For adults there are a litany of standardized testing protocols and procedures available to the clinician to use dependent on the case. After finishing a clinical at a Pediatric Trauma 1 hospital where I spent an extensive amount of time treating children with cardiovascular pathologies I began to ask what is the most valid and reliable measure to use for a pediatric population? Similar to adults, pediatric cardiac procedures have improved and patients are living longer(1,2,3). Due to this increased survival rate it would be beneficial to examine the most appropriate functional capacity or exercise test for pediatric patients as the goal of allowing the patient to perform activities at their highest level of functional independence is similar but the hemodynamic response to exercise, gait mechanics, respiratory mechanics are different from adults and amongst different ages of children. From what I gathered from staff members is that many are not sure either. This post will evaluate two of the most commonly used exercise tests for pediatrics patients, the Bruce Protocol and 6 minute walk test. The benefits and limitations will be provided for each test as well as a summary and recommendation for clinical implementation. 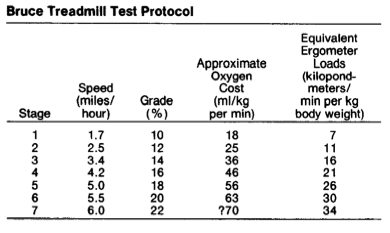 The Bruce Protocol is a progressive graded treadmill test. The standard protocol consists of 7 stages, each lasting three minutes. The test can last up to 10 stages though most patients don’t surpass stage 6. The test starts with having the patient walk at 1.7 mph (2.7 km) up a 10% incline and after each 3 minute stage both the treadmill speed and incline are increased according to the protocol (Figure 1). Heart rate, EKG and Respiratory rate are constantly assessed, rate of perceived exhaustion (RPE) is taken every minute, blood pressure is taken after each stage. The patient’s VO2max is then determined either by using a regression plot based on the stage the patient completed (if the test was not a true max test), vitals response and body-weight or gas exchange analysis (Figure 2) (if available at the facility). The Bruce provide a more accurate assessment of cardiovascular system’s function, more specific information on what caused the termination of the test, a more accurate estimation of VO2max and constant monitoring of vitals. The test has had gone through countless meta-analyses and systematic reviews examining it’s validity and reliability amongst other measures; established norms have been developed for healthy pediatric populations (4,5). The 6 minute walk test (6MWT) is a non graded constant load, constant intensity exercise test used to assess the submaximal level of functional capacity. The test is relatively simple in that it only requires a 100-ft hallway (Figure 3) and no exercise equipment or advanced training to administer it. This test measures the distance that a patient can quickly walk on a flat, hard surface in a period of 6 minutes. It evaluates the global and integrated responses of all the systems involved during exercise, including the pulmonary and cardiovascular systems, systemic circulation, peripheral circulation, blood, neuromuscular units, and muscle metabolism (9,10,11). The 6MWT does not determine peak oxygen uptake as it is by design a submaximal test. It does not provide specific information on the function of each of the different organs and systems involved in exercise or the mechanism of exercise limitation, as is possible with maximal cardiopulmonary exercise testing (9,10,11).Patients who become fatigued are in fact allowed to take a rest break . Some authors argue that the results from a 6MWT should not be used to supplant a formal exercise test (such as the Bruce) however some studies suggest that it is a reliable measure of functional capacity (9-11). A systematic review evaluating the effectiveness of the 6MWT in pediatric populations published Physical Therapy and found that there was a large variation in test procedures among the included studies, and only 1 study followed all ATS guidelines (10). In addition to that having a child “walk as fast as they can without running” is a potential problem in regards to compliance due to patient understanding. That may result in skewed data and other statistical or methodological issues. The Bruce does provide a more accurate assessment of the cardiovascular system’s function however the testing conditions are not reflective of normal daily physical activity. Due to the lack of instrumentation required, the usage of more normal gait conditions and since most activities of daily living are performed at submaximal levels of exertion the 6MWT appears to the more valid test to assess tolerance to functional activity for this patient population. Although Bruce is more a specific test for cardiovascular function the 6MWT is more valid for assessing tolerance to functional activity. More research is needed to examine the cause for the inconsistencies in administration of the 6MWT. Cardiac Rehabilitation in the pediatric population is greatly underutilized, and though clinical research on this aspect of therapy is promising it has been limited (2). However, a systematic review by Tikkaken et al in 2011 found that the “benefits [of cardiac rehab cardiac rehabilitation in children with congenital heart disease] have been observed in many studies, and no adverse events have been reported”. This is encouraging however with any intervention more evidence needs to emerge to support its implementation. 3) Algra S et al, Improving surgical outcome following the Norwood procedure, Neth Heart J (2011) 19:369–372. 10) Bartels, B et al, The Six-Minute Walk Test in Chronic Pediatric Conditions: A Systematic Review of Measurement Properties, Physical Therapy. 2013; 93:529-541.